Ah, The Land of Enchantment. New Mexico is full of compelling and natural outdoor activities throughout a diverse terrain the likes of which isn’t seen anywhere else in the United States. New Mexico’s offerings include everything from the vast Rocky Mountains to the phenomenal Carlsbad Caverns to even an expansive desert. This southwestern gem truly has something for everyone. And if you happen to be a Jeepster, well then it’s certainly a great place for you. New Mexico’s unique landscape lends itself to some of the more intriguing Jeep trails in the country, and they’re all waiting to be conquered by you! Since it’s still summer, you’ll probably want a tool for easy Jeep hardtop removal. Shop now for your TopLift Pro and get simple, convenient hardtop removal and storage for all of your Jeeping needs. If you want to take it on the trail with you, no problem! Our unique apparatus is easily portable and comes with a special carrying case for those overnight trips. 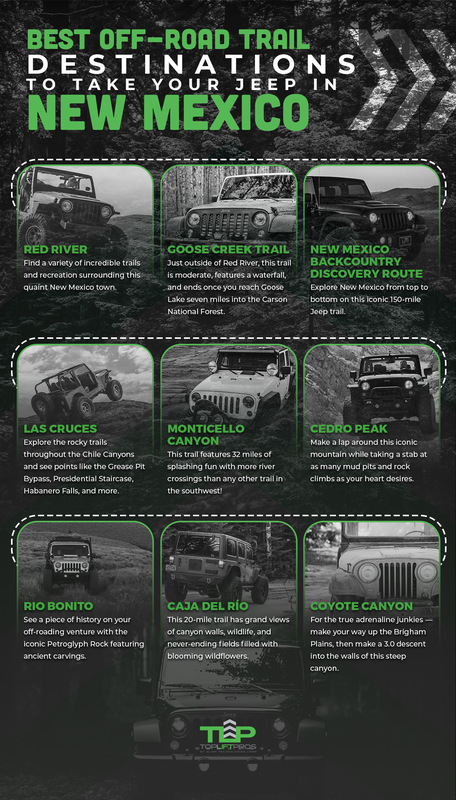 Keep reading to see where you should take your Jeep in the Land of Enchantment. Whether you’re a native or a first-time visitor, it’s important you first know the state’s rules and regulations when it comes to off-roading before hitting those great New Mexican trails. First, you need to make sure your off-road vehicle is properly registered to operate on public lands. If you have a Jeep you use everyday, this shouldn’t be a problem. Second, you need to make sure everyone is properly secured with safety equipment, whether it’s simply a seatbelt, or a car seat for your tiny companions. Next, remember to practice proper etiquette and stay on the roads and trails at all times. Remember, however, that this is merely a watered down version to help you prepare for your excursion. In order to stay fully compliant, you must contact the proper authorities for updated laws, regulations, and statutes when it comes to off-roading in New Mexico. If you need help, the New Mexico Off Highway Vehicle Alliance can help point you in the right direction. Located in New Mexico’s high country, Red River offers a whole lot of off-roading and recreation options throughout the year. Whether you want a more basic trail or an advanced off-roading experience, Red River’s terrain can help you find the adventure and memories that will last a lifetime. The signature Jeep destination in the Red River area is Greenie Peak in Carson National Forest, which is packed with beautiful scenery and ends atop the mountain (elevation of over 11,000). This is a simple trail great for family outings in the Jeep. One of the more notorious excursions through New Mexico takes you through the Land of Enchantment from top to bottom – literally. This extensive route takes you from Dell City, Texas, where you’ll see great high elevation views from the Guadalupe Rim, all the way through the mountains of the Gila National Forest, Chloride Canyon, and more, until you reach the very top of New Medico. You’ll pass through small towns, historic sites made famous by Billy the Kid, and a whole lot more on this statewide journey. Learn more about Jeeping through the NMBDR here. The southwest corner of this southwest gem, Las Cruces features a vast trail system great for intermediate and advanced Jeepers alike. Explore the rocky trails throughout the Chile Canyons and see points like the Grease Pit Bypass, Presidential Staircase, Habanero Falls, and more. Located in southern New Mexico, this 32-mile trail takes you through the Monticello Canyon and nearby Cibola National Forest, offering year-round water crossings (78 of them to be exact) — more than any other off-road trails in New Mexico! If you’re looking for a trail that offers surreal landscape views along with plenty of splashing to keep you cool in the southwest sun, Monticello is waiting for you. Dive a little deeper into the Cibola National Forest to explore the Cedro Peak Trail. This manageable nine-mile Jeep trail circles Cedro Peak (7767 feet) with optional turnouts to mud pits and more for those looking for more of a challenge along their trek. Cedro Peak also offers incredible hiking and camping destinations to accompany your off-roading adventures. If you’re looking for an off-roading venture that doubles as a great tourist destination, then check out the Rio Bonito Petroglyph National Recreation Trail. This 2.1-mile loop features a creek, campground, and the historical Petroglyph Rock, where you’ll find a variety of ancient carvings from past civilizations that called this remarkable area home. Just outside of Red River, New Mexico is where you’ll find this incredibly popular destination for hikers and jeepers alike. The trail is rated as moderate, features a waterfall, and ends once you reach Goose Lake seven miles into the Carson National Forest. If you’re looking for an easy-going cruise with little challenge yet a reward at the finish line, then this is the trail for you and your Jeep! 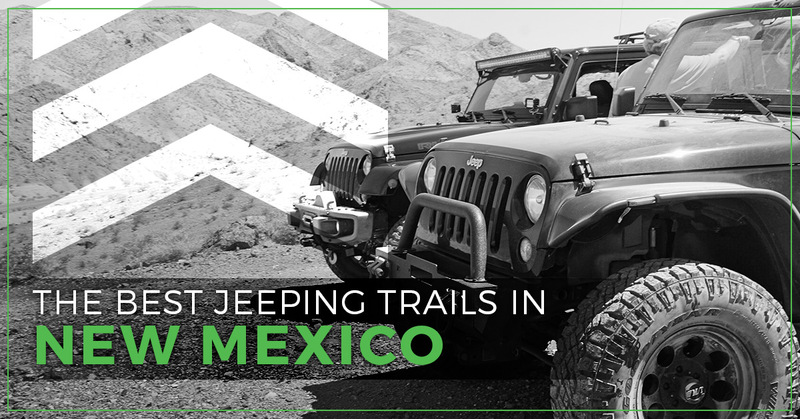 For a trail that will truly test your offroading abilities, Caja del Rio is a trail that Jeep owners nationwide come to visit. Just outside of Santa Fe in the National Forest, this 20-mile trail has grand views of canyon walls, wildlife, and never-ending fields filled with blooming wildflowers. This iconic New Mexico trail will seem simple at first, but be wary of the deep mud pits that will sneak up on you if you aren’t on your toes. While the terrain can be tricky, it is still manageable — even in a stock Jeep Wrangler with no aftermarket off-road accessories. Deep in the southern region of New Mexico, just outside of Tularosa, you’ll find the legendary Coyote Canyon. This scenic Jeep trail will have you climbing rocks and making tight squeezes as you make your way up the Brigham Plains, crossing over to an overlook on top of the bluff. The trail then makes a 3.0 descent into Coyote Canyon and follows down the wash for five miles. Sliders are highly recommended for tackling Coyote Canyon’s steep ledges. Whether you’re hitting trails from our list or other New Mexico Jeep trails, you need to have the most essential Jeep hardtop removal tool in your arsenal. The TopLift Pro allows you to easily remove your Jeep’s shell so that you can experience New Mexico’s trails like they were intended. 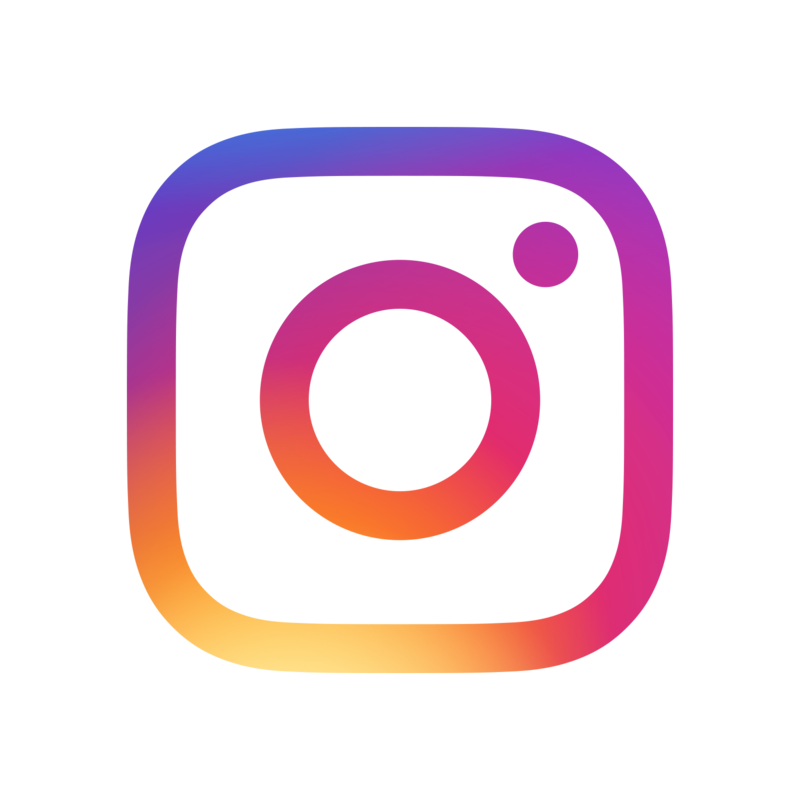 Get your TopLift Pro today.